Hives can be a vexing condition. They can show up in the morning and be gone the same day. Or they can move from one place on your skin to another. What are they and what can be done about it? Hives are red, itchy weals that are elevated from the surrounding skin and can have a blanched center. They can appear anywhere on the body and can range in size from a few millimeters to a few centimeters in diameter. The medical name for hives is “urticaria”. It’s estimated that 20% of the population will get them at some point in their lives. Hives are one of the very few skin diseases that show symptoms and then resolve rapidly. Oftentimes this results in making a doctor’s appointment for treatment only to show up for your appointment with no displaying of symptoms. In these situations hives can still be diagnosed by accurately recounting your signs and symptoms. Since hives fluctuate so much and so fast, it’s helpful to take photos of your outbreak and to bring them with you to your appointment. 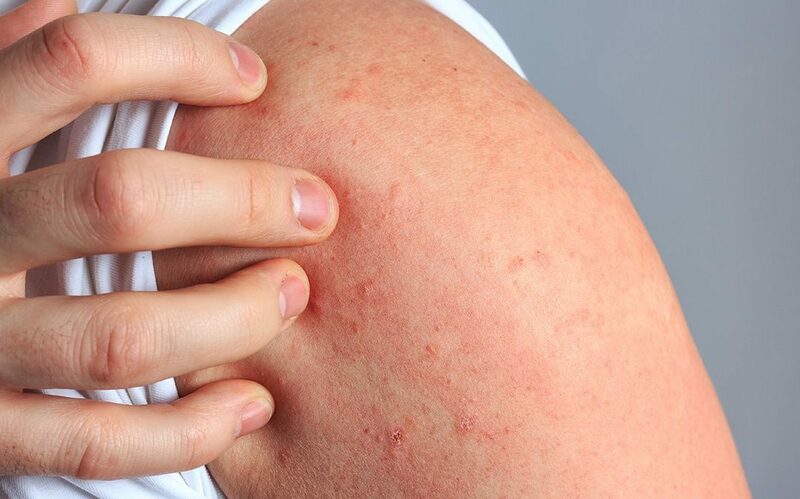 Hives appear when cells in the skin, called mast cells, leak histamine and other compounds into the local blood vessels causing the surrounding skin to swell. Hives are very common and since they are most often produced by an immune mechanism, they are not considered contagious. Some people swear that hives are stress related but stress by itself does not cause hives. Occasionally hives are produced by environmental forces like heat, cold, and sunlight. Hives typically resolve on their own over a period of weeks and are rarely cause for medical alarm. Typical hives are not associated with long-term or serious medical complications. Hives can be caused by allergies to such things as foods, medications, food coloring, preservatives, insect stings or bites, or an infection but in the majority of cases, no specific cause if ever found. This can be frustrating to the patient, who understandably wants to know the root cause so they can make changes to avoid future outbreaks. However, changes to diet, cleaning regimens, and makeup use are rarely helpful unless there is a strong correlation between the behavior or substance and the outbreak. The best way to treat hives is to treat the symptoms. Antihistamines are the most common form of treatment. Topical therapies for hives are also available but are generally ineffective. These treatments contain ingredients such as camphor, menthol, diphenhydramine, and pramoxine. These creams and lotions generally do not require a prescription. Applying a cool compress may also help soothe the itch of a hives rash. Hives can be broken down into two categories based on the length of duration. There’s acute urticaria which resolve in six to eight weeks and chronic urticaria which lasts longer than eight weeks. There are rare forms of chronic urticaria that are produced when the patient makes antibodies against molecules on the surface of their own mast cells. If this is suspected, there are tests available to identify these type of hives. There is an advanced treatment option for Chronic Idiopathic Urticaria (CIU). The medication is called Xolair. It is indicated for patients ages 12 or older who have suffered from hives for greater than 6 weeks and have not responded to H1 Antihistamines. It is a once monthly injection given in the office. If you are experiencing hives, your family doctor may be able to treat them. A dermatologist can also diagnose hives and treat your symptoms. At Summit Plastic Surgery & Dermatology we specialize in skin care: from dermatology procedures all the way up to Mohs surgery (skin cancer surgery). You can find us in Wimlington, Hampstead, and Supply NC. At Summit Plastic Surgery &amp; Dermatology we specialize in skin care: from dermatology procedures all the way up to Mohs surgery (skin cancer surgery). You can find us in Wimlington, Hampstead, and Supply NC. Suffering from Hives? We can help! If you are suffering from hives or other skin conditions, we can help. Call us at (910) 794-5355 or click below to schedule your appointment today.